LOCATION: Propagation and production research was conducted at the Mountain Horticultural Crops Research Station, Henderson Co. State-wide evaluation trials and on-farm trials were also established. Initial signs indicate that ‘Shiloh Splash’ PPAF is going to be a successful introduction that will yield North Carolina growers substantial returns. There are currently 10 nurseries in North Carolina trialing/producing ‘Shiloh Splash’ PPAF. More companies will be impacted as plants move into re-wholesale, garden center, and landscape contracting markets. Initial sales should begin in 2005. Efforts are also underway to establish markets in Europe, Japan, Australia, and New Zealand. Educational programs on the propagation, production, and use of this plant have been presented to over 500 people at diverse programs including the International Plant Propagators Meeting, Green and Grow’n Show, and numerous Extension meetings. Our native river birch is one of the most popular trees for southern nurseries and landscapes. It is utilized extensively due to its attractive ornamental features, excellent adaptability (tolerance to heat and clay soils), and it is one of the only birch species with resistance to bronze birch borer. There are currently only a few named cultivars of river birch including ‘Summer Cascade’ PPAF a weeping river birch that was marketed through our program with support from the NC Specialty Crops Program and is now being grown world-wide. ‘Shiloh Splash’ PPAF is a new variegated selection of river birch that arose as a sport on a tree at Shiloh Nursery in Harmony, North Carolina. 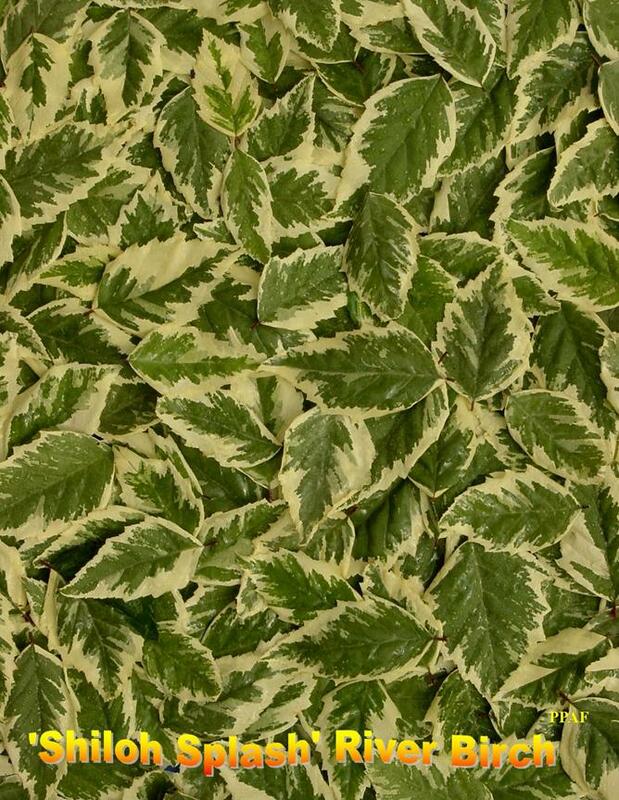 The leaves have a green center with an attractive ivory margin that makes for a striking effect. Develop propagation protocols for stem cuttings. Distribute plants nationally for regional landscape evaluations. Propagate and distribute stock plants to North Carolina propagators/growers. Establish propagation stock block at the MHCRS for use by NC Nurserymen. Propagation studies were conducted to optimize and refine production protocols. Terminal, softwood, cuttings were collected on 13 July, 2004. Cuttings were pruned to approximately 5” with the lower leaves removed. The basal 1” of the stems were dipped for 5 sec. in treatment solutions ranging from 0 to 10,000 ppm auxin formulated as either indole butyric acid (IBA) dissolved in 50% isopropyl alcohol or the potassium salt of indole butyric acid (KIBA) dissolved in water. Cuttings were stuck in a medium of 50% peat : 50% perlite and placed under intermittent mist in a shaded (~50%) glass-covered greenhouse. Cuttings were arranged in a completely randomized design with 15 replications. Production demonstrations were developed for tours and field days. A stock block of ‘Shiloh Splash’ PPAF was established to provide North Carolina growers with a source of propagation material. Plants were propagated and distributed to growers. On-farm trials were established with growers across the State. Propagation. There was no influence of auxin concentration on percent rooting for either IBA or KIBA (Fig. 1A and 1B); cuttings rooted between 70% and 100% regardless of treatment. However, root number was influenced by auxin concentration. Root number followed a cubic trend in response to IBA concentration with the highest root number between 2,000 and 4,000ppm (Fig. 1B). Root number increased in response to KIBA, but there was no significant trend in root number between 2,000 and 10,000 ppm KIBA (Fig. 2B). Other observations indicated that rooting potential declined considerably later in the season. Stock block. A stock block of 50 ‘Shiloh Splash’ PPAF has been established at the Mountain Horticultural Crops Research Station. These plants will be available as a source for propagation material for North Carolina nurseries. Distribution of Stock Plants. Over 500 plants were propagated and distributed for stock plants and for evaluation. In addition to distributions to NC growers, plants have been sent to institutions (Universities, Arboreta, etc.) around the country for promotion and evaluations. Promotional materials. Images and slides of ‘Shiloh Splash’ PPAF have been distributed and are available upon request. Posters and flyers have been developed and distributed to producers. Initial results look very promising. There is considerable excitement about this plant. However, the ultimate success of this plant will depend on its performance in nurseries and landscapes around the world over the next few years.